Since 2005, I've been evaluating company store software solutions for our own use and implementing the software for customers who order printing, promotional products and logo'd apparel. I've encountered a lot of questions about online company stores over the years and here are the TOP 7 most common ones. The answers have come both by research and as an eyewitness of seeing solutions put into practice. Hopefully these answers provide consice information that will save you considerable time researching, testing, and finding them on your own. And, you may discover an easier way to place orders, distribute products and manage your brand. 1. What is an online company store? Up until about 15 years ago, companies found that the most economial and convenient way to purchase and distribute company branded products was to buy in bulk and store in an onsite store-room or warehouse. Company managers would "buy" the products from this "company store." Now, instead of walking into the store room, an online company store allows managers to shop a website that shows images of all their their branded products. They can then order what they need and ship to wherever needed. In the past, most products had to be inventoried, but an online company store allows more items to be produced on demand or inventoried at the place of manufacturing so that the costs of maintaining large inventories and managing a warehouse are greatly reduced or eliminated. For many companies large and not so large, an online company store is now the most economical and convenient way to purchase and distribute products. 2. What problems could an online company store solve for me? Do you have any renegade managers who want to get their own quotes from a myriad of sources wasting a lot of time? Or are managers ordering marketing products with an inconsistent logo thus weakening your brand? An online company store can reign them in. Do you experience communication delays and/or errors? If your current system requires the message to pass correctly through 3 or more people - such as a manager who orders and sends to purchasing department who sends to the printing source - then the potential for delays and errors is higher than it needs to be. An online company store visually displays the product so that the right item is ordered and both the person ordering and a manager can receive an instant e-mai confirmation. One overall manager can have authority to approve the order before it proceeds along to the vendor. Do you experience business card hassles going back & forth with proofs? Business cards and other products with variable data can be modified and proofed immediately online improving accuracy and speed. "Who took the last box off the shelf?!" Ever have problems running out of stock? A good online ordering software will automatically update your inventory, and can be used to alert you when inventories are low. Hard to control spending? You can know exactly how much each cost center is spending and easily bill them back if you want to. You can also see all the order history and usage reports to make the most economical decisions about the amount of each product you want to buy. To sum up, an online company store can put you back in control.It allows you to decentralize the ordering responsibility, AND increase the central control. 3. Who uses online company stores? Any company or franchise that has branded products to order and distribute or that has more than one location. Or as in the case of an employee apparel store, there may be a large number of buyers who are best served by being able to view, order, and pay with a credit card online. 4. How big does a company need to be to utilize an online company store? As few as 5 years ago the rule of thumb was a minimum of about $100,000 per year expenditure on branded products, but with advances in company store technology some distributors are willing to take on clients with as little as $5,000 - $10,000 annual expenditure. 5. Who provides the company store online shopping cart software and sets up the e-commerce site? There are a number of software suppliers but most serve print distributors or advertising specialty distributors because the cost of the software plus the learning curve to utilize it and set it all up on a website is usually prohibitive for just one company. Most companies utilize the services of a print distributor or promtional product/apparel distributor who can also provide the company store as part of their service. 6. What should I look for in a company store provider and what is the cost? You can tell a lot by visiting the company's website. Does the distributor offer all of the products you anticipate needing now and in the future? This one question may narrow the field considerably. Good providers usually have an online company store demo available on their website. Test drive it to see how easy it is to use and whether it does everything you need it to do. Look for a company that has online published product pricing that is reasonably competitive. Regarding the cost for the company store, some companies may charge annual fees plus an initial company store set-up. These costs usually vary based on the number of products to be set up (driving the cost up), and the projected sales (driving the cost down). Some distributors may be willing to simply match your previously paid product prices in order to gain the whole account and you can proceed that way. It is worth asking because if they are willing you've just accomplished a major upgrade to your ordering and distribution system at no additional cost! 7. Would an online company store make sense for my company's needs? After you've researched what you can generally, you'll probably still want to talk over your company's specific needs with an online company store provider to explore the nitty-gritty of how their system would work for you. A good company store provider will offer this type of counsel at no cost and may even help prepare a presentation or company store demo with a few of your company's branded products which is ideal for presenting your company store research to a boss, board, or other decision-makers. The online company store trend is growing because it provides better control of the brand, cuts costs and saves everyone a lot of time. More mid-sized and smaller companies are taking advantage of it as minimum expenditure thresholds have come down in recent years. What questions do you have that didn't make this TOP 7 list? Share them in the comments and we'll make sure to answer them! 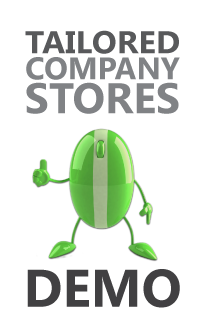 Request an Online Company Store Needs Assessment & Report Today!